FoxyUtils MergePDF is a webapp that enables you to manipulate with your PDF files in easy, intuitive and safe way. With only few click of your mouse and short time waiting for them to upload, your PDF files will be merged instantly and be offered to you to be saved on your hard drive. By default, files you have uploaded will remain in the cloud server for one hour after they were last accessed, but advance users may opt in for more permanent storage solutions. FoxyUtils MergePDF can manipulate with the maximum PDF size of 50MB. 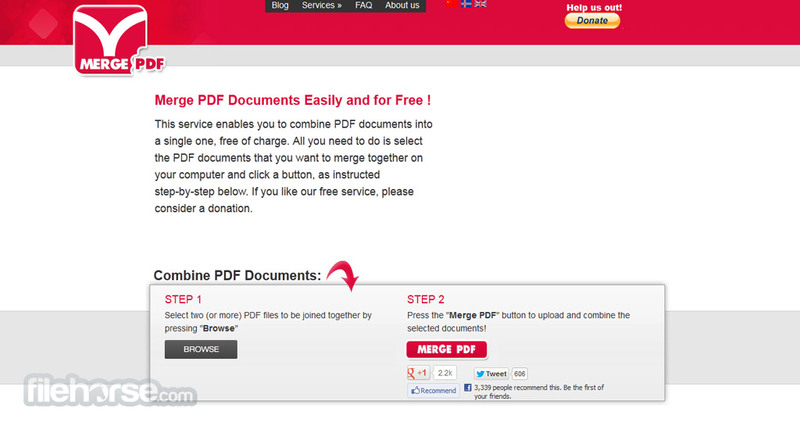 Merge PDF Files Online for Free! All the PDF tools you need, since 2008! FoxyUtils is a collection of easy to use, time-saving online tools to merge, split, convert, and use PDF files. Founded by two experts in network security, FoxyUtils uses a proprietary library and gives back to the environment by planting a tree for every 5,000 conversions on its site. Simply drag and drop your document in your browser, and wait a few seconds to download. No need to spend hours dealing with PDFs, focus on what matters most instead. No need to update your software, or deal with installation issues. FoxyUtils lives in the cloud, so you can rely on our tools to deliver wherever and whenever you need to convert PDFs. We have built our tools over 8 years, optimized them through millions of conversions, and we continue to test and improve each one of our tools to ensure high quality. We are a team of network security experts. All FoxyUtils users are connected securely over HTTPS so your username and password, along with any files, are as secure as possible. MergePDF is a very small but also very useful webapp that allows users from all around the world to more easily manage their PDF documents no matter what type of computer they are using or where they are. If you have modern computing device that has internet access, then you can load MergePDF without any problems and very easily take two PDF files of your choice, upload them, and in mere seconds receive updated files that will have content of both documents merged into one PDF file. This simple tool does not offer much customization abilities or advanced features, but when you are on the move, when you are accessing computer that is not your own, you can always have access to tool that will reliably, quickly and safely merge two or more of your PDF documents. Even though MergePDF offers simple service, its developers managed to offer both free an premium level of service that users can easily take advantage off. Anonymous use allows creation of PDF files that are up to 30 MB of size, with no secure uploads using HTTPS protocol and website dashboard that features ads. Users who register for free account will see their size limit be lifted to 50 MB, and those who pay $4.99 per month will gain access to 200 MB files, secure uploads and no ads. This monthly subscription also gives users access to three other apps that developers form FoxyUtilscreated – SplitPDF, UnlockPDF and ProtectPDF. Merge PDF Files Online for Free! Save time with our selection of PDF tools. Whether you are looking to merge, split, convert, unlock, or protect PDF files, we have online tools that are reliable, fast, and easy to use. This service enables you to split PDF documents free of charge. All you need to do is select the PDF document that you want to split up on your computer, specify the desired page range, and click a button, as instructed step-by-step below. This Compress PDF file service enables you to shrink the file size of your PDF documents, free of charge. All you need to do is select the PDF document that you want to compress, and push a button, as instructed step-by-step below. Unlocks the PDF file without asking for password unless needed. In some cases a password is required. A password can be entered in which case webapp will use it to try to unlock the file. If none of these approaches works, then the access to the file will not be granted. Limited to files with PDF encryption as defined in the PDF standard. Files with encryption such as a DRM, are not handled by UnlockPDF. This PDF to Word conversion service enables you to convert PDF documents free of charge. All you need to do is select the PDF document that you want to convert up on your computer, and push a button, as instructed step-by-step below. This PDF to Excel converter enables you to convert PDF documents to Excel files, free of charge. All you need to do is select the PDF document that you want to convert, and push a button, as instructed step-by-step below. This Word to PDF converter enables you to convert PDF documents free of charge. All you need to do is select the Word document file that you want to convert up on your computer, and perform the conversion with the click a button, as instructed step-by-step below. This PDF to JPG service enables you to convert PDF files to JPG images, and extract images out of your PDF files, free of charge. All you need to do is select the PDF document that you want to convert, and push a button, as instructed step-by-step below. This JPG to PDF service enables you to convert JPG images to PDF, free of charge. All you need to do is select the JPG images that you want to convert to PDF, and push a button, as instructed step-by-step below. This PDF to ePUB service enables you to convert PDF files to ePUB books, and extract images out of your PDF files, free of charge. All you need to do is select the PDF document that you want to convert, and push a button, as instructed step-by-step below. This ePUB to PDF converter enables you to convert your ePUB books to PDF, free of charge. All you need to do is select the ePUB files that you want to convert to PDF, and push a button, as instructed step-by-step below.